A suspense drama exploring the damage that one psychopath can unleash on the lives of many, Alfred Hitchcock's Strangers On A Train builds nicely into a little storm of turmoil. But the plot of evil most crazed eventually runs out of steam, and settles for meandering down the path of relative ordinariness. While on a train ride, famous tennis player Guy Haines (Farley Granger) meets Bruno Anthony (Robert Walker), a talkative stranger who insists on sidling up to Guy and eventually invites him to dinner. As they chat, Bruno reveals that he hates his strict father, and also demonstrates his knowledge of Guy's personal life, as chronicled in the society pages: Guy is divorcing his abrasive wife Miriam (Laura Elliott) in order to marry Anne (Ruth Roman), the daughter of a wealthy senator. Bruno progresses from annoying to creepy when he suggests that the two can commit the perfect murders: Bruno would be willing to kill Guy's wife to speed up Guy's marriage plans if in return Guy would kill Bruno's father. With neither man having a motive or knowledge of the victim, Bruno reasons that they would both get away with murder. Guy dismisses Bruno's plan as rubbish talk, but Bruno goes ahead and actually kills Miriam by strangling her at an amusement park. Guy is horrified, and has no intention of killing Bruno's father, but Bruno insists that Guy hold up his part of the supposed deal, and starts to stalk Guy and Anne, turning their lives into a nightmare. Strangers On A Train enjoys an excellent first half. 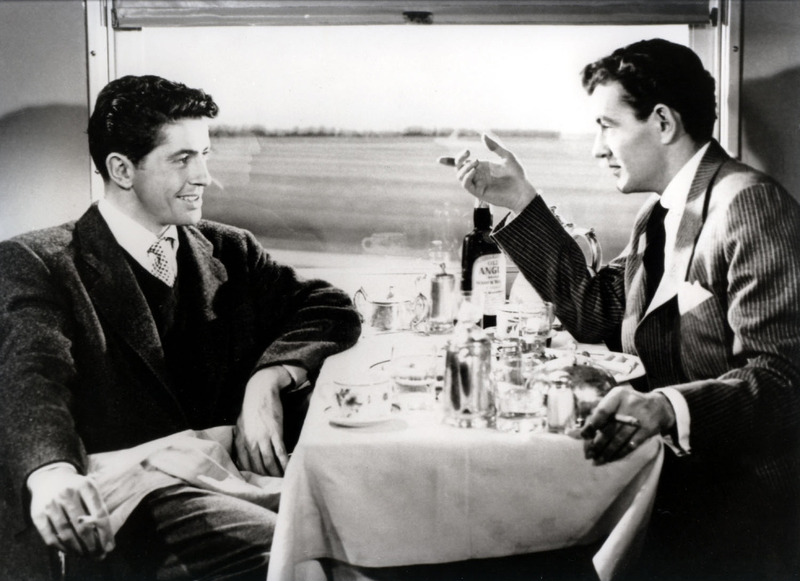 The pivotal encounter on the train opens the movie and is gratifyingly uncomfortable. Hitchcock increases the level of peril facing Guy in small but steady increments, as the train interaction is followed by an ugly confrontation with Miriam, pregnant with the child of another man and changing her mind about the divorce for pure financial gain. Bruno unleashing his murderous madness on Miriam is handled with sharp accuracy, the monster within finally revealing his worst tendencies. The second half levels off in terms of the suspense, with Bruno publicly and loudly intruding into Guy's life and therefore compromising the entire premise of the two being strangers. The side-bar of two police officers visibly tailing Guy's every move to try and solve Miriam's murder never gains traction and does not meaningfully contribute to the plot. But the ending is where Strangers On A Train simply runs out of ideas, Bruno unconvincingly taking forever to execute his unimaginative revenge on the non-compliant Guy, while Guy participates in an interminable tennis match. The climax on an out-of-control fairground carousel ride descends into a frantic punch-up and a rushed denouement. Robert Walker delivers the best performance, his Bruno a study of a man far into abnormal territory, and equally far from recognizing it. His distinguished appearance and initially smooth social manners mean that he can easily conceal his condition, making him even more formidable. Walker allows Bruno's menace to shine through scheming eyes, a tight smile, and mannerisms that land just on the wrong side of excessively friendly. The troubled Walker died at age 32, just two months after Strangers On a Train was released. 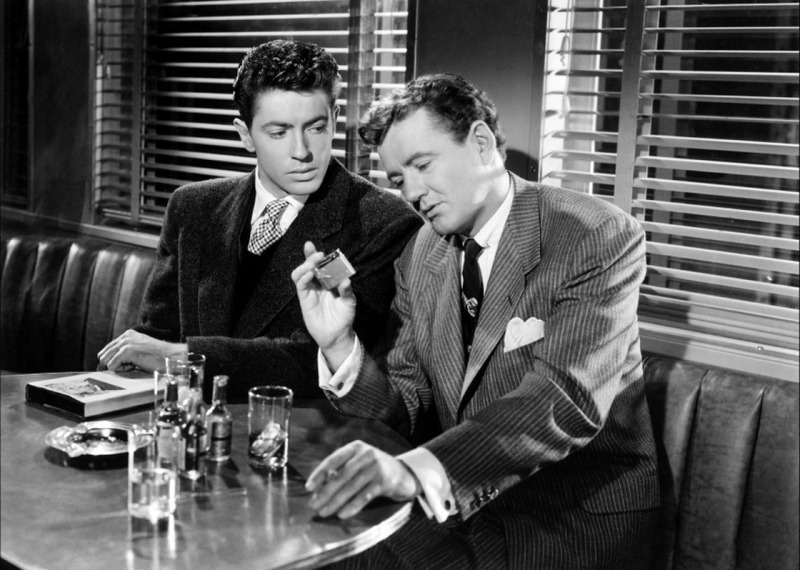 Farley Granger is adequate as Guy, although he does not bring much that is special to the role. There are no opportunities in the script (co-written by Raymond Chandler) for Guy to demonstrate how he won the affections of Anne, or to delve into the character of a top-level tennis athlete. 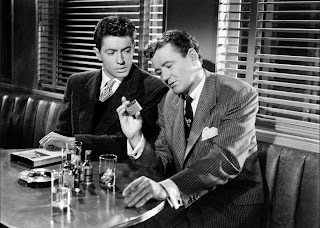 If Rope (1948) was a study of arrogance attempting to perform the perfect murder, Strangers On A Train finds a mentally troubled mind equally trying to connive towards a brilliant crime. Rope is the intellect thinking itself into false invincibility; Strangers On A Train is the intellect twisted by derangement into depraved instability. Both are examples of Hitchcock's devious ability to create worryingly unavoidable encounters with men who are seemingly normal yet full of ill intent.